These two buildings, constructed in 2010, with their total of 16 apartments, are located directly in Softwarepark Hagenberg, in the immediate vicinity of the university. 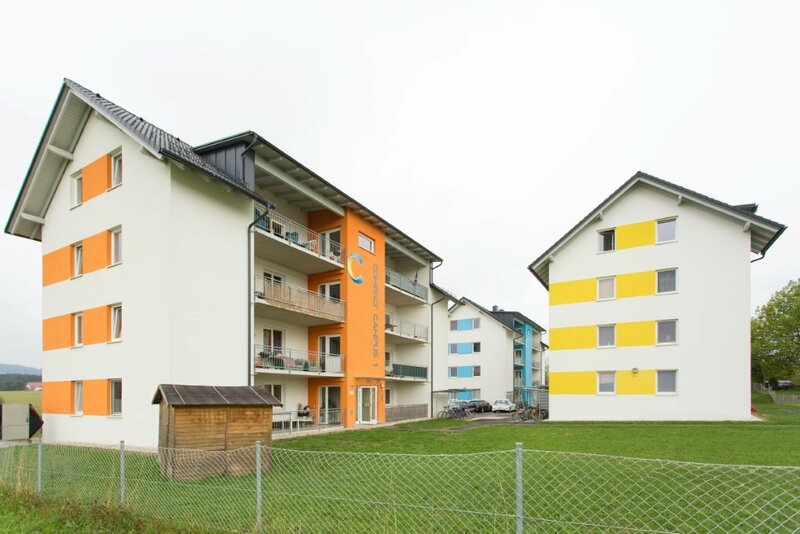 This residential complex was designed together with students in order to meet the requirements of students as closely as possible. 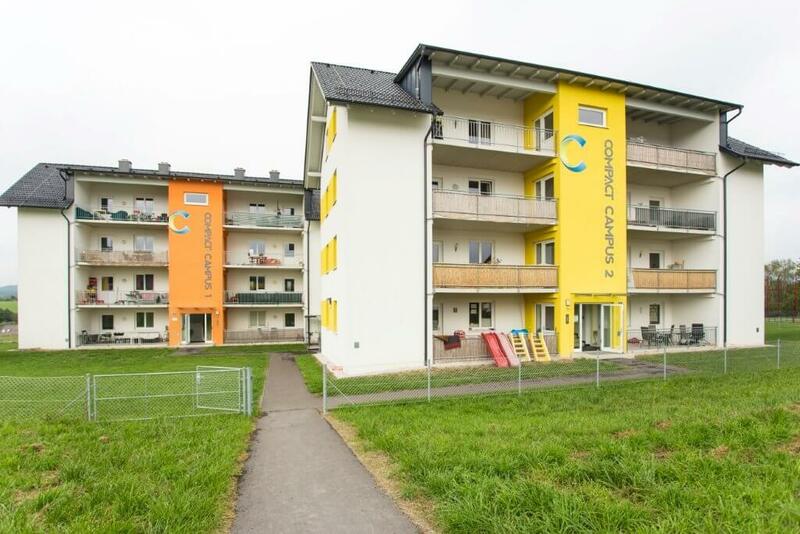 This modern residential complex, specially for students, is located directly in Softwarepark Hagenberg, in the direct vicinity of the university. 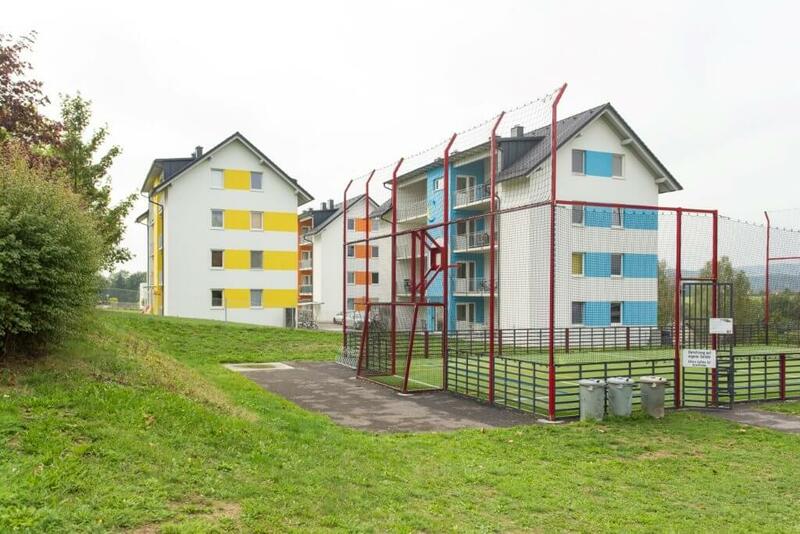 This residential complex was built in low-energy construction with eight apartments (around 75 m² living space incl. recessed balcony). 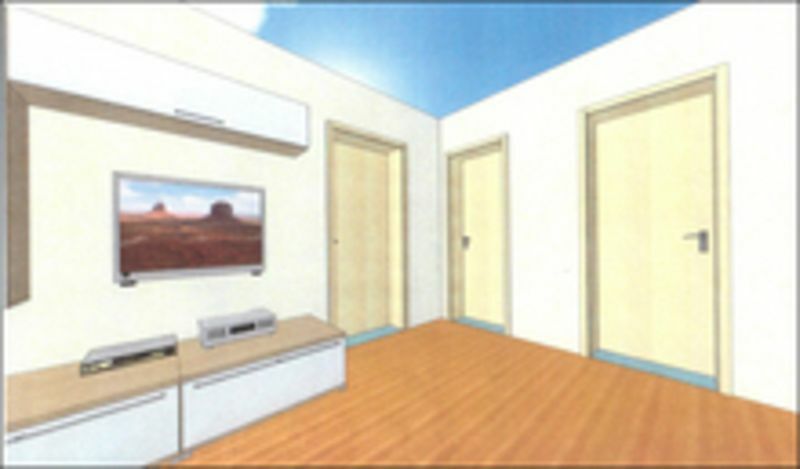 Each apartment consists of three rooms, a communication room including kitchen, bathroom and WC. In addition, each apartment has a large, roofed recessed balcony. 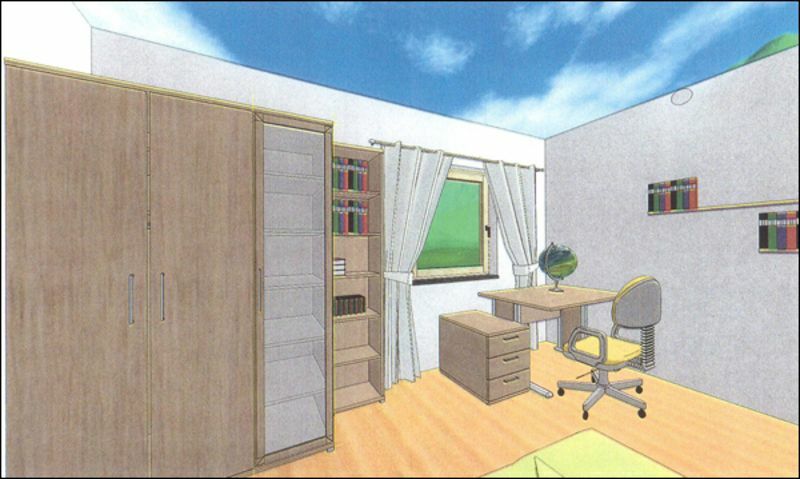 For the students, the new complex means that they no longer waste time travelling between the university and apartment. This residential complex is ideal for everyone who attaches a lot of importance to an optimal lifestyle; the generously sized, built-in recessed balconies are particularly conducive to this. The bright, south-facing and roofed recessed balconies convey to the inhabitants of each apartment unit a pleasant feeling of freedom. Each apartment has three equal sized rooms, bathroom and WC and a shared living and dining area with proper kitchen block. The 75 m² apartments are designed to be shared by 3 people and consist of 3 equally large bedrooms, a shared living/dining area, fully equipped kitchen block, bathroom/WC and a generously sized, roofed and south-facing recessed balcony. 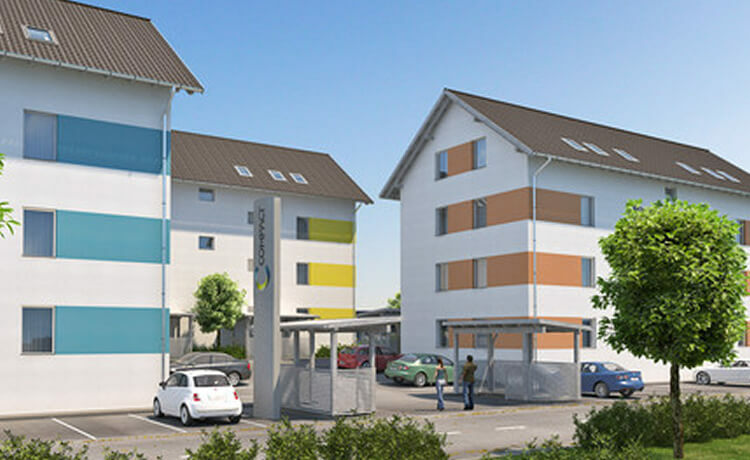 For each storey (for 2 apartments) there is a storage room with washing machine connection and a total of 24 parking spaces are available to the residents. The bathroom is equipped with a washbasin, a shower and a connection for a washing machine. Bathroom and WC are separated. The shared apartments consist of three equally sized bedrooms, each approx. 11 m². Generously sized cooking/living area of approx. 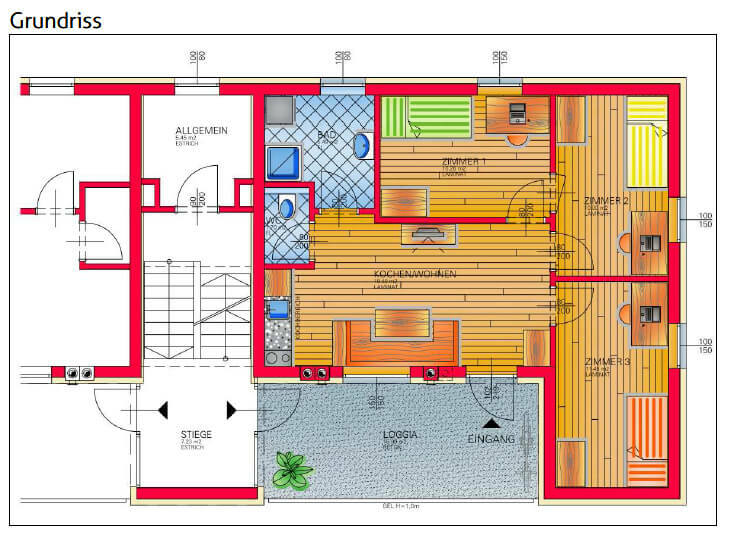 20 m² and recessed balcony of approx. 15 m². Each house possesses a laundry room and three common areas which can be used as e.g. storage or drying rooms. On the grounds of the residential complex there are large green areas for sunbathing, barbecuing and other leisure activities. Each room is equipped with TV and broadband internet connection. Thanks to the low energy construction and heating (underfloor heating) with air heat pumps we able to keep running costs extremely low – on top of the environmental factor. 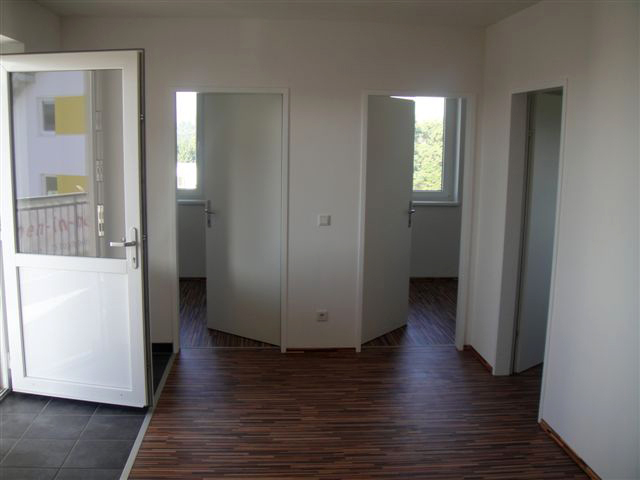 In House 3, two apartments have been fully furnished and can be moved into immediately and without additional costs. Unpack your suitcase and feel at home straight away. 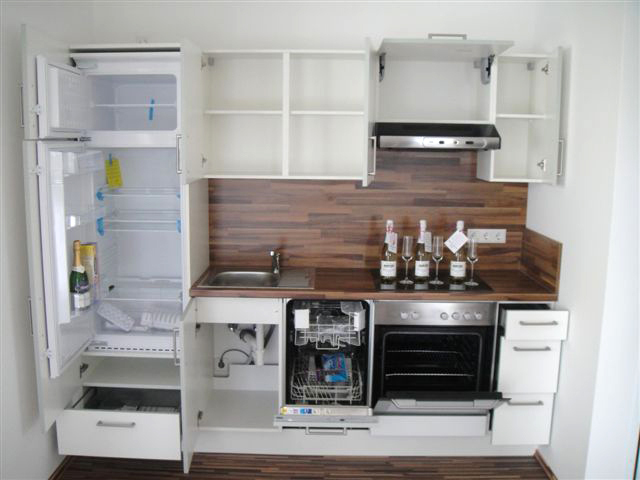 The apartments are equipped with high-quality furniture. Enquire now and secure a place in a shared apartment. 16 apartments located directly on the Uni Hagenberg Campus are available to students. Two minutes on foot away from the FH 1 building, in the middle of green spaces, the 75 m2 apartments offer the ideal environment for combining studying and living.